You need asparagus, just tripped and cut up. Then onion, garlic, flour, milk, mayo, grated cheddar, and Ritz crackers, heck yes. Maybe some salt and pepper, and that’s it! 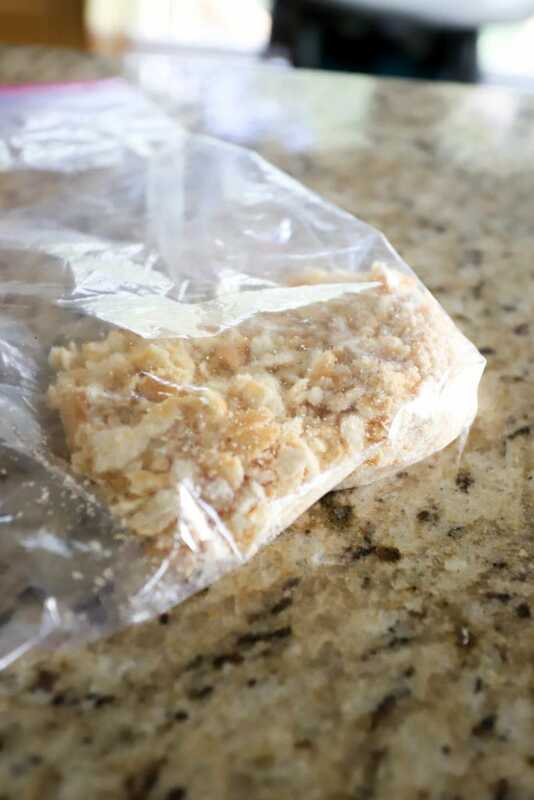 To start, crush the crackers in a bag and set them aside. 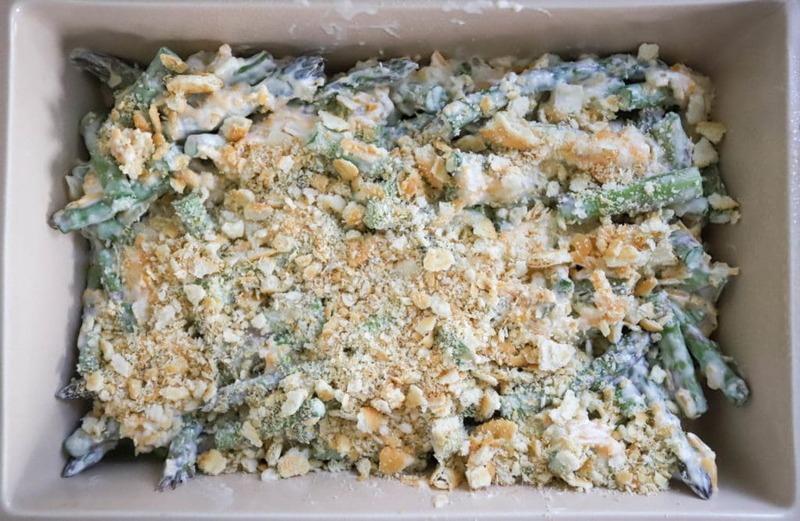 Then, add the asparagus, grated cheese, and mayonnaise to a bowl. 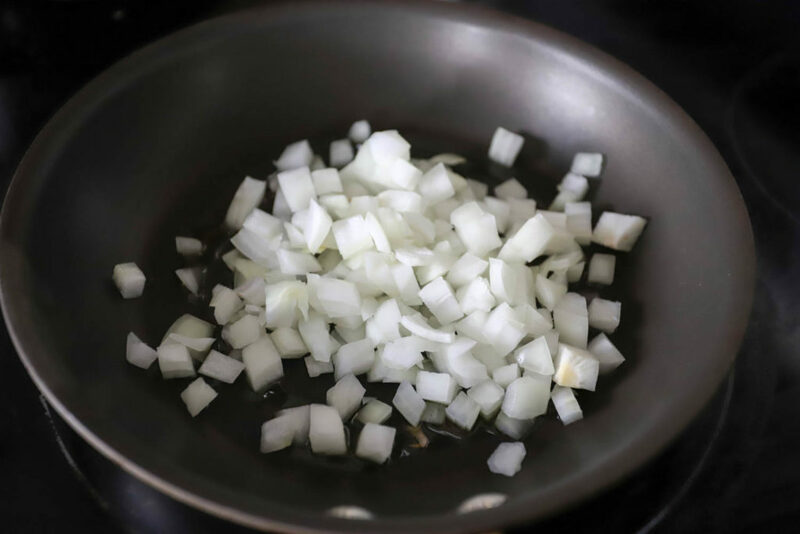 Heat the onions in a skillet over medium heat for about 5 minutes with a drizzle of olive oil. 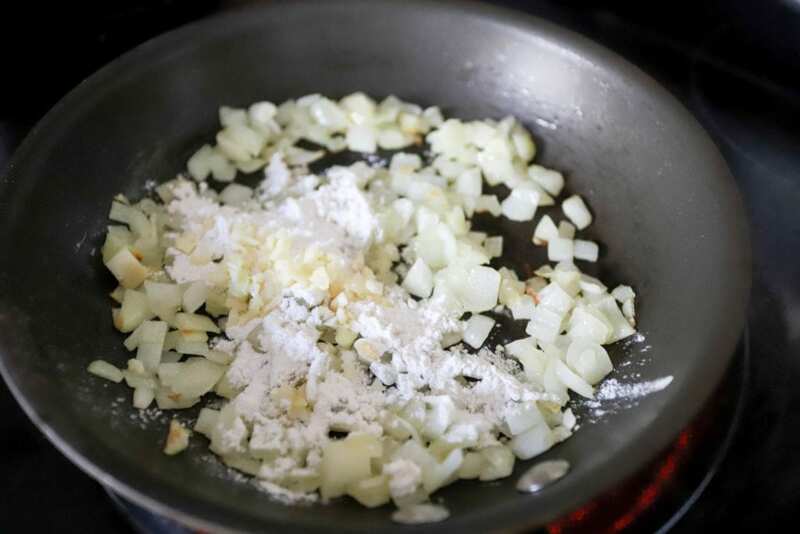 When the onions soften and brown just slightly, sprinkle the garlic and flour over the onions. Stir them together to create a roux. A paste! Let the onion mixture cook, stirring, for a minute or two to brown the flour just slightly. Then, very slowly pour in the milk, stirring as you go to incorporate the milk into the flour. The mixture should be smooth. Stir until the milk comes to a bubble, then sprinkle the mixture with salt and pepper and turn off the heat. 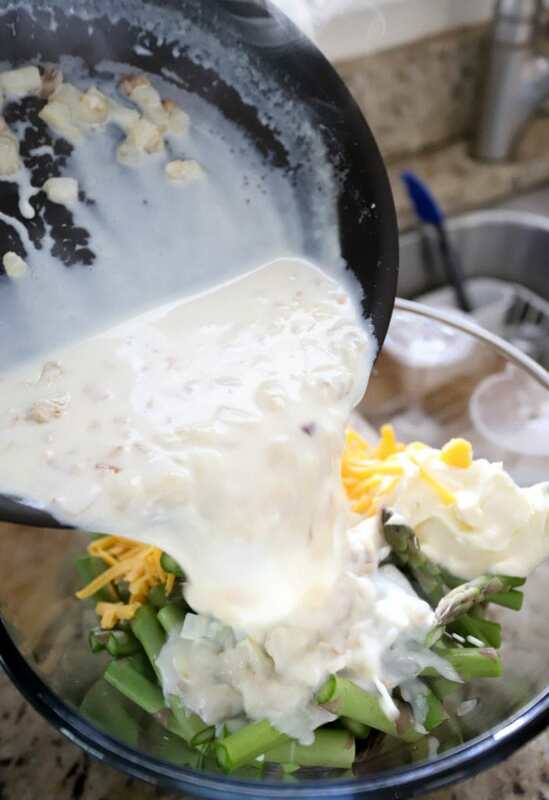 When the milk/onion mixture has thickened, pour it into the bowl with the asparagus and other ingredients. Stir everything together, and pour the mixture into a baking dish prepared with some cooking spray. Sprinkle the crackers over the top of the casserole. Now, you can a million percent make this in advance and bake it on Thanksgiving (or on a Tuesday, whatever), just keep it in the fridge for a few days before you want to eat it. If you’re worried about oven space, you can also bake this halfway, for 15 minutes or so, then finish it cooking on the day of your big meal. 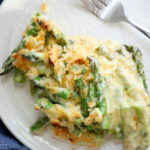 The dish bakes at 375F for 40-50 minutes until the asparagus is tender but not mushy and the cheese is hot and bubbly. And that’s it! 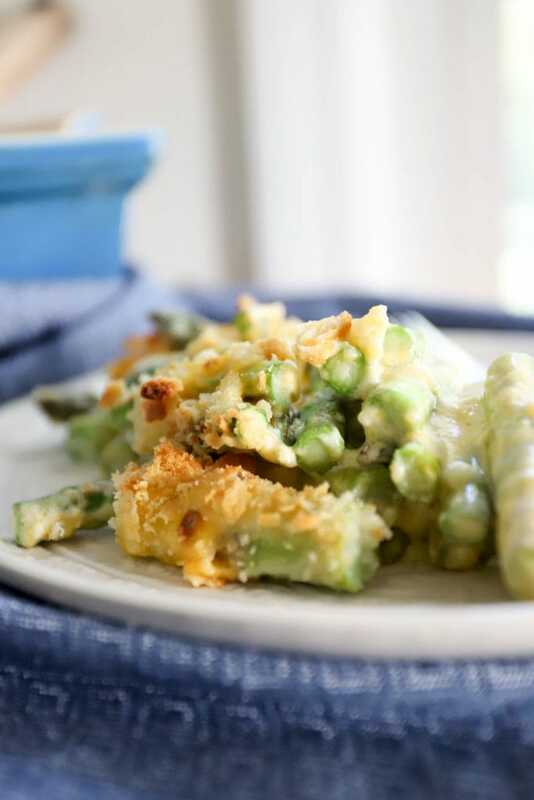 The flavors are classic but the asparagus is a nice twist. 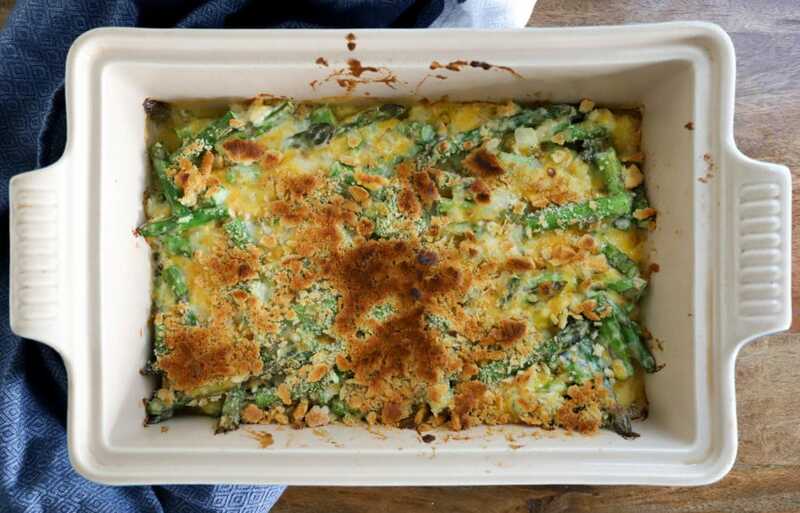 PS this would work perfectly with broccoli so you could totally double the cheese ingredients and make 2 casseroles that are identical but with different veggies. Don’t tell anyone, but you could totally get away with it. I’m thinking we should probably practice our Thanksgiving side dishes a few times per week all month, right? Bookmark this one for your big meal for sure. It’s SO simple and delicious and a great addition to your other favorites. Enjoy! 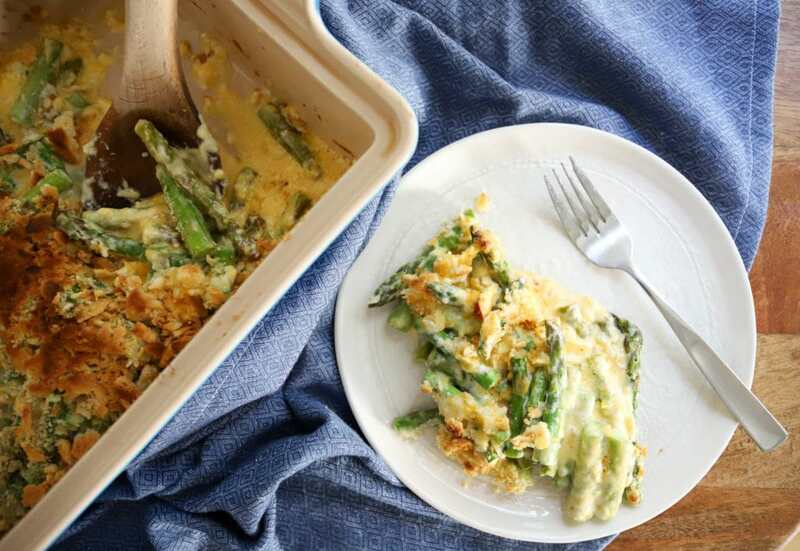 Easy, cheesy asparagus casserole comes together in just a few steps and is the perfect make-ahead side dish. 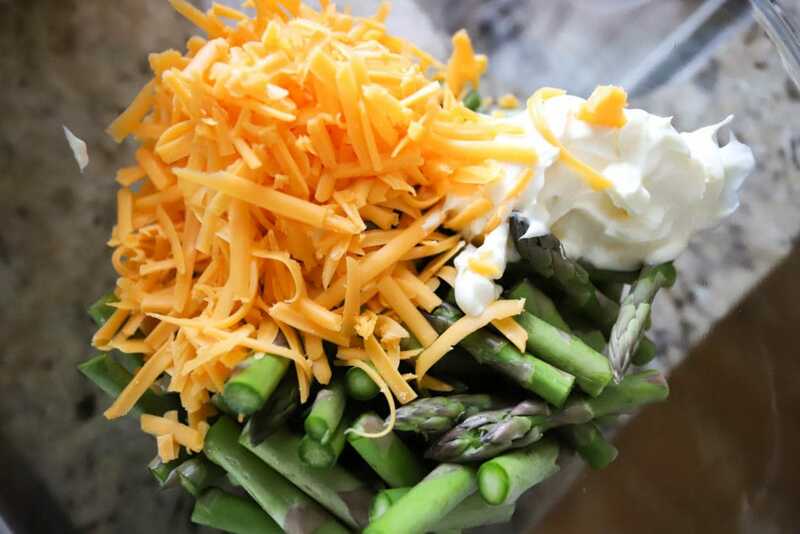 Place the asparagus, mayo, and cheese together in a large bowl. In a skillet over medium heat, add the onion with a drizzle of oil. Saute the onion for about 5 minutes until soft and slightly browned. Sprinkle the garlic and flour all over the onion mixture. Stir to create a roux and let the flour cook for a minute or two. 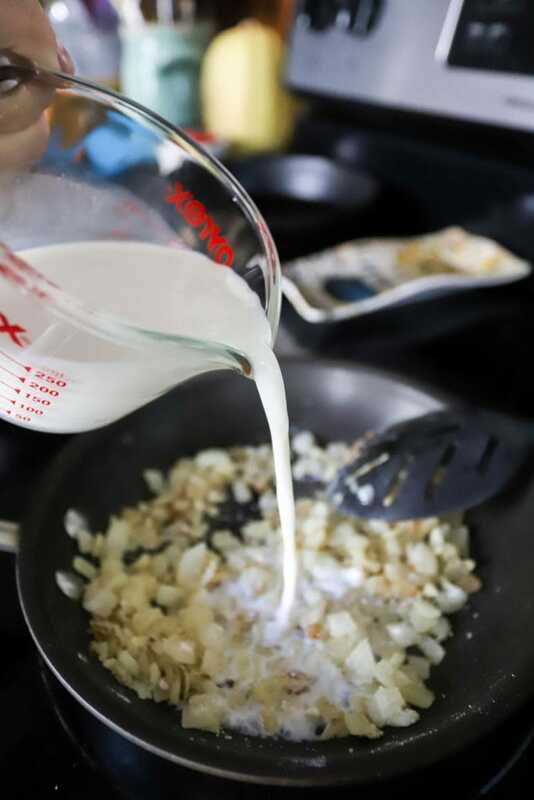 Very slowly pour the milk into the skillet, stirring as you go to incorporate the milk into the flour mixture. Let the milk sauce come to a bubble. Sprinkle with salt and pepper. 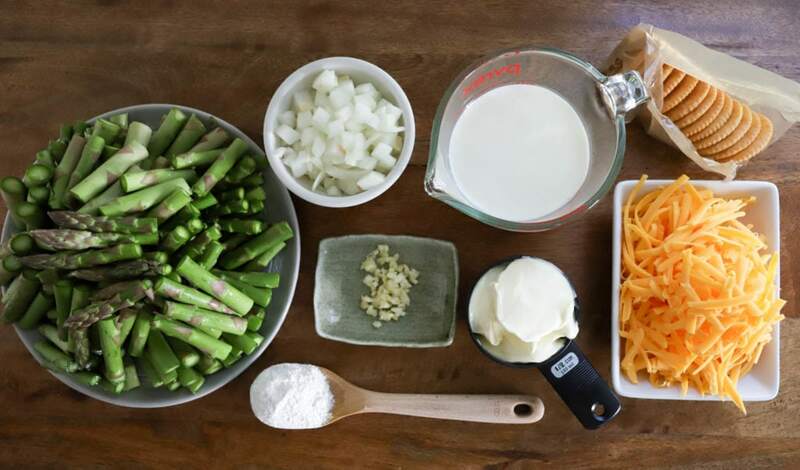 When the milk sauce is slightly thick, pour it into the bowl with the asparagus and other ingredients. 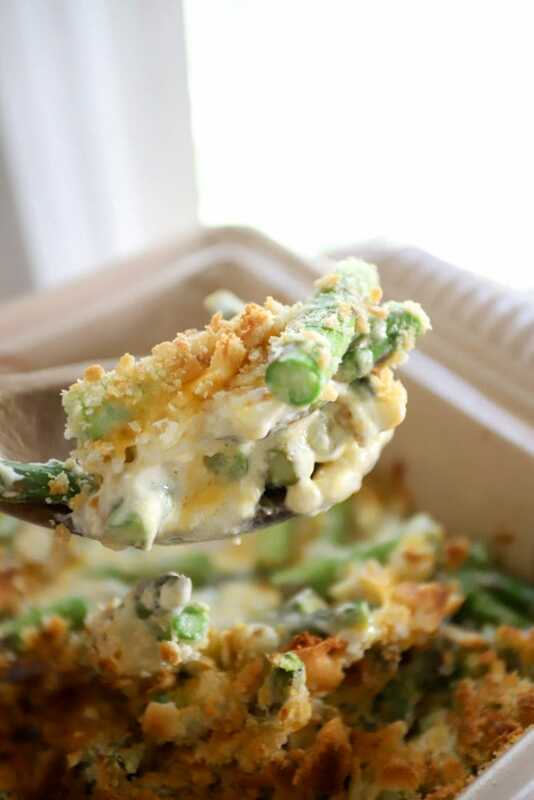 Stir to mix everything together, and pour the mixture into a baking dish, 9×13 or similar. Sprinkle the crushed crackers over the casserole. 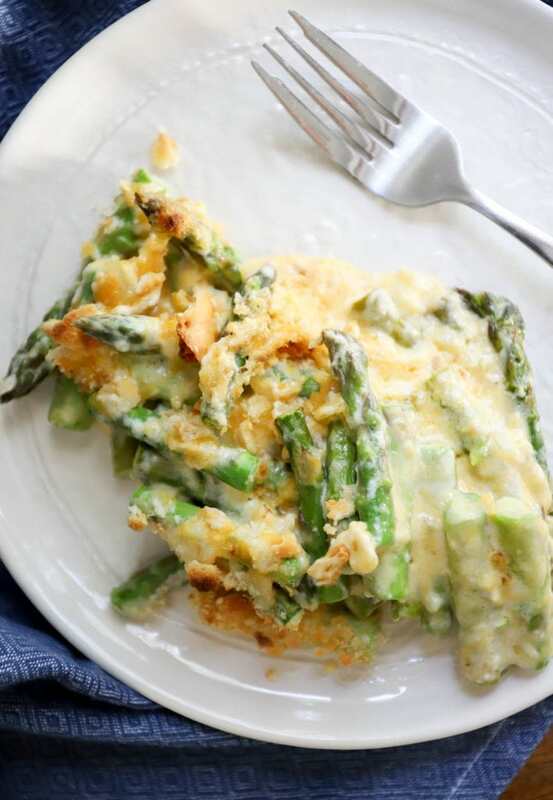 Bake the asparagus casserole at 375F for 40-50 minutes or until the asparagus is just tender and the cheese is bubbly. Broil the top for one minute if you’d like to brown the crackers. Make this in advance up to the baking step, it will keep in the fridge for 3 days or so. Then bake right before eating. That is so nice, I mean that really! Thank you for reading! Do you have another suggestion for the Ritz crackers? I am not a fan of them but the rest of the recipe sounds great!!! Any carby crunchy thing you like! Other crackers, potato chips, panko, bread crumbs, any of it. Or leave it out and the casserole will still be delicious. 🙂 let me know how it turns out!